Meghdoot, a corrugated shipping cartons manufacturer, has installed first HP Scitex FB10000 Industrial Press in India at its facility in New Delhi. New Delhi: Meghdoot, a corrugated shipping cartons manufacturer, has installed first HP Scitex FB10000 Industrial Press in India at its facility in New Delhi. The firm plans to enhance production efficiency and grow their business with the new technology in India. The company has emerged as a front runner in shipping box manufacturing with a production capability of 5000 metric tonnes per month. 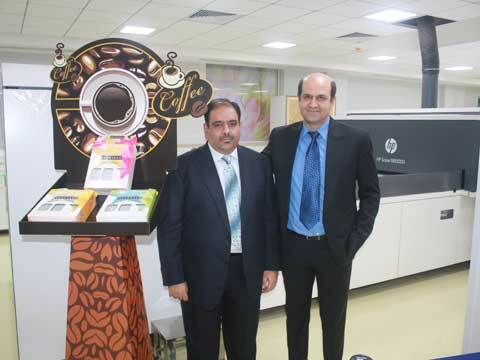 Meghdoot is the first company in India to install the HP Scitex FB10000 and also the first company in Northern India to deploy the HP Latex 3000 printer at its premises in New Delhi. "Brand managers and marketers in India have to constantly stay ahead of the market dynamics in the in-store signage and POP displays. They are demanding advanced POP solutions which can best meet their needs of color accuracy, consistency and high quality while being affordable at the same time," said Rohit Kapoor, executive director and CEO, Meghdoot. With the recent installation of the HP Scitex FB10000 Industrial Press, Meghdoot will address the need for digital production of POP graphics and corrugated display in the market which is currently challenged by analog production methods. "Retail marketers in the country have been increasingly demanding affordable yet best in class POP solutions without compromising on brand creativity," said Puneet Chadha, Director, Market Development, Graphic Solutions Business, HP Asia Pacific and Japan. With the flexibility to experiment with varied shapes and sizes, it will be easier for Meghdoot to take on more jobs, expand opportunities and increase profit potential.